Arrive at Entebbe airport where an Aerolink member of staff will assist you with the check-in and transfer to your 07:45am (arrival 10:05am) or 12:30pm (arrival 14:35pm) domestic flight to Kasese, check-in time is one hour before the flight. 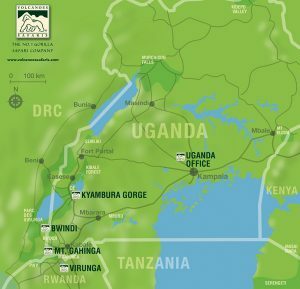 Once in Kasese you will be welcomed by your expert guide who will provide knowledge and assistance throughout your journey. Transfer to Queen Elizabeth National Park and the contemporary Kyambura Gorge Lodge. Enjoy pre-dinner drinks on the veranda that overlooks the savannah plains with the magnificent Rwenzori Mountains in the distance. Either take an early morning or evening game drive for the best opportunity to see game. What you see depends on the season, but the Kasenyi plains are excellent for sighting lion and large herds of Uganda kob. The Mweya peninsula is one of the best places to look for leopard, which live in the dense, scrubby thickets. You can also visit various community projects from the Volcanoes Safaris Partnership Trust (VSPT) including: Women’s Coffee Cooperative Tour, Reclaimed Wetland Tour, Bee-Keeping Fence Visit, Omumushaka Dance Group Performance, Empundu Playground Visit and much more. opportunities and the knowledgeable guide will provide a great insight into this globally important habitat. Either go gorilla tracking again (additional permits required, upon payment of supplement, subject to availability), or opt for one of the other, gentler but equally rewarding alternatives available (see above).